Remember that I told you last time that Python if statements are similar to how our brain processes conditions in our everyday life? That’s true for for loops too. You go through your shopping list until you’ve collected every item from it. The dealer gives a card for each player until everyone has five. The athlete does push-ups until reaching one-hundred… Loops everywhere! 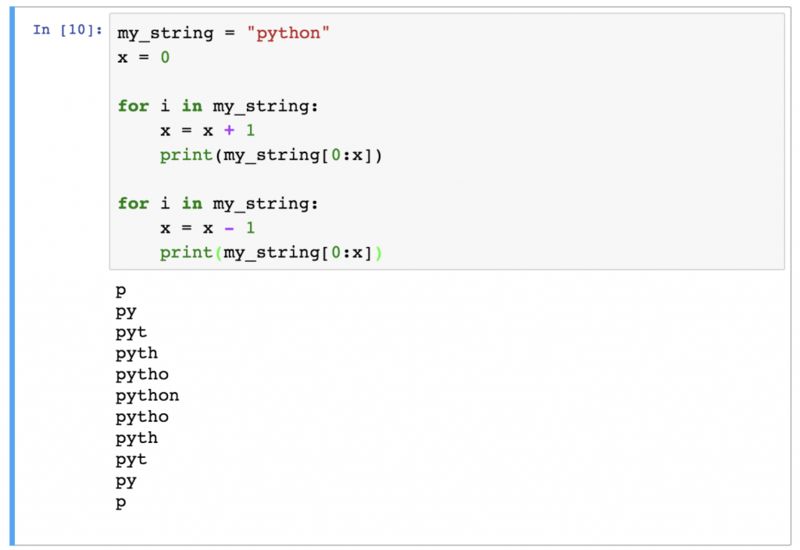 As for for loops in Python: they are perfect for processing repetitive programming tasks. In this article, I’ll show you everything you need to know about them: the syntax, the logic and best practices too! Let’s take the simplest example first: a list! Say that we want to square each of the numbers in this list! Note: Unfortunately the numbers * numbers formula won’t work… I know, it might sound logical at first but when you will get more into Python, you will see that in fact, it is not logical at all. We set a list (numbers) with five elements. We took the first element (well actually, because of zero-based indexing, it’s the 0th element) of the list (1) and stored it into the i variable. Then we executed the print(i * i) function, which returned the squared value of 1 which is also 1. We took the next element – we assigned it to the i variable. We executed print(i * i) again and we got the squared value of the second element: 25. … until we got the last element’s squared value. This was the most basic example of a Python for loop… but no worries, it won’t get more difficult; only more complex. Just one comment here: in my opinion, this section is the most important part of the article. I see many people using simple loops like a piece of cake but struggling with more complex ones. The reason is: they learned the syntax but they don’t get the logic. So please, if anything is unclear, re-read this section again and again… spend time with it! And I promise, later on, you will thank yourself for this investment of time because you will profit a lot from it. 1.) 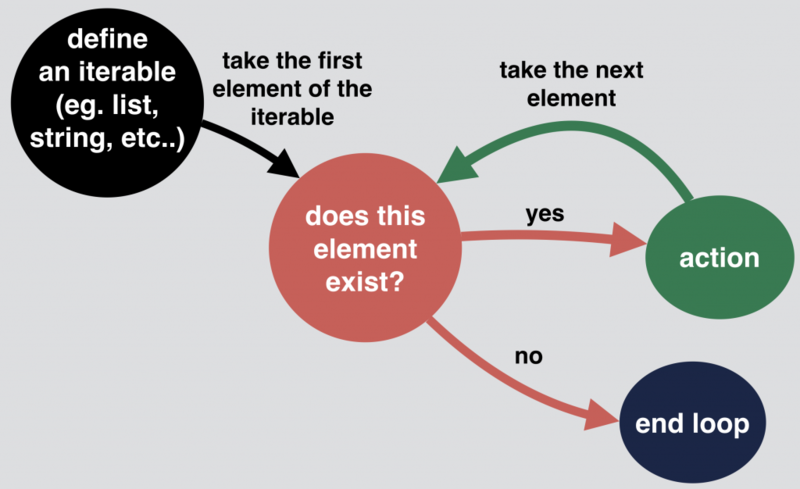 Define an iterable! (E.g. the list we defined earlier: numbers = [1, 5, 12, 91, 102]). for and in are Python keywords and numbers is the name of our list… But, what I want to talk more about in this section is the i variable. It’s a “temporary” variable and its only role is to store the given element of the list that we will work with in the given iteration of the loop. Even if this variable is called i most of the time (in online tutorials or books for instance), it’s good to know that the naming is totally arbitrary. It could not only be i (for i in numbers), but anything else, like x (for x in numbers) or hello (for hello in numbers) or whatever you prefer… The point is, set a variable and don’t forget that you have to refer to it when you want to use it inside the loop. 3.) Stick with our numbers-example! We take the first element of our iterable (well, again – because of zero-based indexing – technically it’s the 0th element of the list). The first iteration of the loop will run! The 0th element of our list is 1. So the i variable is set to 1. Note: More info about zero-based indexing: here. 5.) The function itself, inside the loop, was print(i * i). As i = 1 the result of i * i will be 1. 1 will be printed to our screen. 6.) The loop starts over. 7.) We take the next element and since there is an actual next element of the list, the second iteration of the loop will run! The 1st element of the numbers list is 5. 8.) So i is 5. print(i * i) runs again and the result is printed to our screen: 25. 9.) The loop starts over. We take the next element. 10.) There is a next element. So here comes the third iteration. The 2nd element of the numbers list is 12. 11.) print(i * i) is 144. 12.) The loop starts over. The next element exists. The iteration runs again. 13.) The 3rd element is 91. The squared value of it is 8281. 14.) The loop starts over. Next element exists. The iteration runs again. 15.) i is 102. The squared value of it is 10404. 16.) The loop starts over. But there is no more “next element.” So the loop ends. This is a very, very detailed explanation for a 3 line script, right? Don’t worry, it’s enough if you only crunch this once. In the future, you can just go ahead and use those 3 simple lines, because the underlying logic will be in the back of your mind! I find it very important to write this down though, because many junior data professionals do not have this in their back of mind… and that reduces the quality of their Python scripts. Easy as pie: we got back the characters one by one. Remember, strings are basically handled as sequences of characters, thus the for loop will work with them pretty much as it did with lists. The first element: this will be the first element of your range. The last element: you might assume that this will be the last element of your range… but it isn’t. It’s a Python thing (well actually you can find this in other programming languages too), but you can define here the element after your actual last… Let’s make this clear by an example: if you assign 10 to the last element attribute, the range will go from 0 to 9. If it’s 11 then the range will go from 0 to 10. Note: If you want to learn more about why Python range() works this way, check out this Quora article: Why are Python ranges half-open (exclusive) instead of closed (inclusive)? The step: this is the difference between each element in the range. So if it’s 2, you will only print every second element. Now, can you guess the result of the range above? 2.) You want to go through a list but want to keep the indexes of the elements too. In this case i will be the index and you can get the actual elements of the list with the my_list[i] syntax – just as we have learned in the Python Data Structures article. Anyway: use range() – it will make your job with Python for loops easier! I know from my data coding workshops that Python for loops are not necessarily easy the first time. They need some sort of algorithmic thinking. Of course, the more you practice, the better you become… But if you get a really difficult task, it’s always a good tactic to get a paper and sketch up the logic first. Go through the first few iterations on paper, write down the results – and things will be much clearer! Just as with if statements, be careful with the syntax. At the end of the for line, a colon is required. And at the beginning of the lines in the loop’s body you have to use indentations. Okay, we have done this! Take a variable and assign a random string to it. Write a script that does this for any my_string value! Note: There is more than one way to solve this task. I’ll show you a relatively simple solution, but feel free to post your alternative solutions in the comment section below! I think the solution is quite self-explanatory. The only trick is that I did set a “counter-variable” called x that always shows the number of characters that I want to print to the screen in the given iteration. In the first for loop this goes up until I reach the number of maximum characters. After that, in the second for loop, it goes down until I have zero characters on the screen. Note: If the my_string[0:x] syntax does not look familiar, check the Python Data Structures article – and the “How to access multiple elements of a Python list?” section. In the next article I’ll write about how to combine for loops with for loops and for loops with if statements. It’s gonna be exciting! Nice solution! Good job, Carl-Gustaf! First off, great blog! It’s been extremely useful for me, and I’m going to work through ALL of it!!! When I did this exercise, I did it a little differently, can you check to make sure my solution is also accurate? thanks, yepp, this is a great solution as well! Good job! Thanks a lot for this post Tomi. It’s informative for the Python beginners. Is it possible for you to explain briefly the logic with an example for nested “for” loops or when 2 variables are used in “for” loop ? Later this year, I’ll create a video tutorial about it to my Youtube channel, too! Haha, I’m glad to hear.